I'm posting this a day early in case you're still looking for an idea for tomorrow. I probably went a bit crazy with the treats and gifts, but it was so much fun! Day 11: Valentine, you color my world! - Trolls came out on DVD and Blu-Ray this week, so I decided it would be perfect for family movie night! I think they've watched the movie five or six times since opening it Saturday morning, so I'd say it was a hit! Day 12: We go together like.....cookies & cream, peanut butter & fudge, strawberries & bananas... There is a frozen custard shop in Grapevine, so we took the kids out after Sophia's soccer game. So yummy! Day 13: You Make My Heart Pop - Both kids love bubbles, so I decided to pick up these fun Bubble Stackers for the countdown. I thought about buying them a bubble machine, but decided to try the stackable bubbles instead. Day 14: Valentine, I Don't Want to Lego of You! ~ Both kids love Legos, so I decided to get them each a Lego set as their final gift. I got Carter a LEGO Architecture set and I got Sophia a LEGO Elves set. We had so much fun with the countdown! I'm already thinking about what I'll do for our Christmas Advent Calendar and the Valentine's Day Countdown next year! Day 8: You're the Missing Piece to Our Puzzle ~ I found these color-in puzzles at Michael's and thought it would be a fun way to show Sophia & Carter how much they mean to us. I used Sharpies to write words to describe them and then had them color and decorate them. Day 9: You're the 'Swedish' Fish in the Sea ~ I forgot to take pictures yesterday, but I purchased these from Target and put them in their mailboxes. Day 10: We're not playing games, we're so glad you're on our team! ~ We love having family game nights (post plan soon with some of our favorite games), so I decided to pick up a few new games as a part of the countdown. I wrapped these so the kids would have something to open when they got home from school. I mean, who doesn't like opening presents? 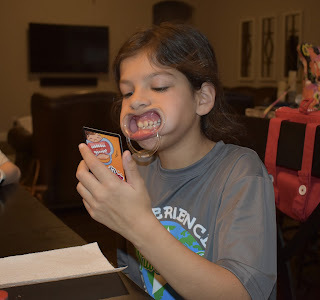 This one is more of a single player game, but it really makes you think and it's small enough to bring with you, so it's perfect for keeping them entertained during dinners out. I also got this one. So. Much. Fun! I was a bit concerned about sharing the mouthpieces, but the game comes with ten, so there was no need to share. But they are so uncomfortable, so be prepared for that! I can't believe there are only four more days to go until Valentine's Day! Day 6: Valentine, you're just write for us! ~ I had originally planned on giving them each a cute Valentine's Day pencil, but then I found fun Valentine's Day pens in the Target dollar spot and decided to use those instead. Anytime I want to do little gifts for Sophia and Carter, I always hit the dollar spot at Target first ~ you can find the cutest things there! Day 7: We love you to pieces, Valentine! ~ I found this Reese's Snack Mix and thought it'd be the perfect treat! Who doesn't love the combination of sweet and salty? Day 3: I Soda Love You ~ Last year I attached the note to a mini can of root beer and we made root beer floats, but Carter isn't a fan of root beer ("too spicy") so I decided we'd try this recipe for Cupid Floats. We used Strawberry Sunkist instead of the Cherry 7-Up. Carter still claimed it was a little spicy, but ended up finishing it so I guess he got over it. I didn't end up using the Red Vines as straws - I had cute black & white paper straws that worked just as well (and were free!). Day 4: You're the Apple of My Eye ~ There is a gourmet apple store in Grapevine so I took Sophia & Carter there and let them pick out an apple. We also ended up picking up some chocolate covered strawberries ~ I couldn't resist! So yummy! Day 5: We don't have words for how much we love you! 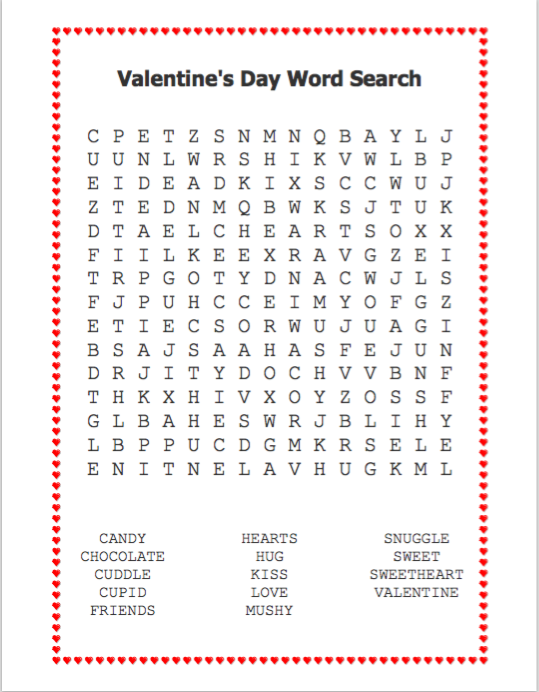 ~ I decided to create a word search on Puzzlemaker for them to work on using Valentine themed words. I hope they're loving this countdown as much as I am! I'll share the next few days later this week. 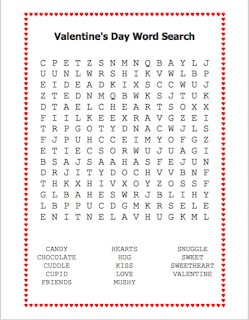 Instead of doing a standard Friday Favorites post, I thought I'd share how we celebrate one of my favorite holidays: Valentine's Day! My #oneword for 2016 was love, and I seriously considered making it my word of the year for 2017 as well (I went with joy instead), so Valentine's Day is definitely one of my favorite holidays. I just LOVE love! Today I thought I'd share what I'm doing to spoil my littlest Valentines! Several years ago I purchased Valentine's Day Mailbox Chairbackers for Sophia and Carter. A few years ago they decided that Michael and I needed to leave them "mail" every day leading up to Valentine's Day, and last year I decided to step up my game a little and leave them little treats along with the notes. I decided it would be fun to share each day with you in case you want to join in the fun! I was originally planning on making cute printables for each day, but ended up just writing them notes on cute Valentine's paper I found in the Target dollar spot. If you Google the phrases you can probably find some cute printables, or you can just hand write the notes like I did. Day #1: We Couldn't Love You S'more - Both Sophia and Carter love making snack bags, so I thought this Valentine's S'mores Snack Mix would be perfect. I purchased Vanilla Cupcake Goldfish, mini marshmallows, Valentine's M&M's, and these fun Cupid's Message M&M's. I found these cute treat cups to hold their snack mix. It was the perfect treat for working on their homework! Day #2: We Go Together Like Cookies & Milk - I found these adorable cookie stamps at Williams-Sonoma and knew that they would be perfect for some Valentine's Day baking! Unfortunately I bought premade sugar cookie dough just to save time, and I really wish I hadn't. The dough was really sticky even though I took it out of the refrigerator right before we used it and kept sticking to the non-stick cookie stamps. I ended up dipping the stamps in flour to prevent sticking, and it did work, but then when I baked them the cookies expanded and the stamps disappeared! Oh well. They still tasted good and the kids had fun with them. This just gives us an excuse to try it again with homemade dough! What's your favorite sugar cookie recipe? I'm having so much fun coming up with new and different ideas to celebrate each day, and Sophia and Carter are loving it! Each day they run to their mailboxes to find the note for the day. It's funny because both days I've had the table set up and they don't even pay attention to what's there - they want to see the love note! I'll be sharing the next three days on Monday, so be sure to check back! Last year I shared both Christmas and Valentine's Day gift guides for the men in your life, so I thought it would be fun to share a wish list/gift guide today! Venus ET Fleur Roses Flowers are an obvious choice, but the flowers from Venus ET Fleur are different because they last a year! They are more expensive than your average floral arrangement, but when you consider how long they last, it's really not that outrageous a price. Apple Watch I have gone back and forth on whether I want an apple watch or not, but I think now that they have a rose gold watch I'm finally on the bandwagon. Love it! David Yurman Earrings Michael bought me the most beautiful diamond earrings for Christmas, so I've been going back and forth on whether or not I really NEED these earrings, but I love the combination of the pearl and diamonds. So pretty! Kindle Paperwhite I mentioned possibly wanting an e-reader in this post. I just think it would be so convenient to be able to throw it in my purse and have a book with me whenever and wherever I find the time to read. Pink Wallet / Black Wallet I have this wallet in turquoise and I love it, but I had a lipstick open up in my purse and it's now stained so I want a new one. The practical side of me is saying I should get the black one because it won't show wear as quickly, but the pink one is so pretty and fun! The compromise might be me buying this one and letting Michael buy me the black one. There's no rule saying you can't buy yourself a Valentine's Day present, right? Problem solved! *Editing to add that both the black and pink Lacey wallets are part of the Kate Spade Secret Sale and are over 50% off! The sale ends tomorrow (2/9) at midnight, so now is the time to buy! I've linked some other fun options in the widget below. 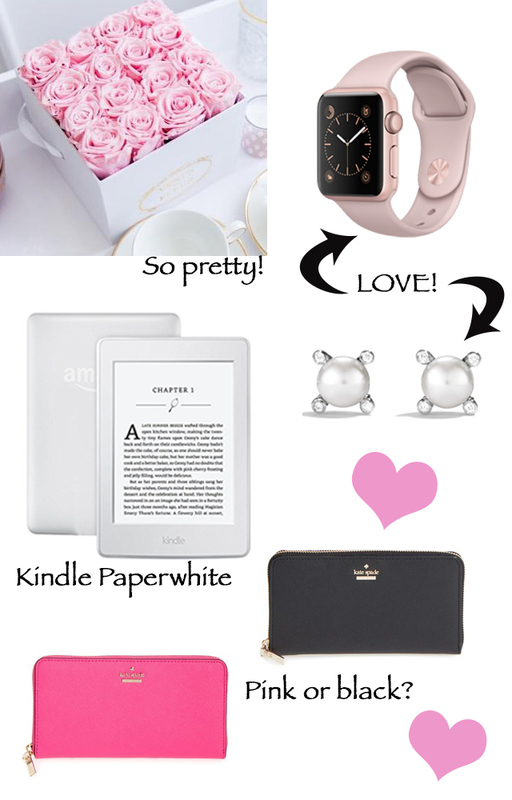 What's on your Valentine's Day Wish List?